JOHANNESBURG, 23 April 2014 - Mpact Recycling, in partnership with Trudon (the publishers of the Yellow Pages), have opened entries to the annual telephone directory and paper drive school competition. 2013 winner of the Mpact Recycling & Trudon (The Yellow Pages) Telephone Directory & Paper Drive, Northcliff High School who collected a total of 2,095 tons of old telephone directories. The competition ran in the Johannesburg area amongst 46 schools from 15-29 July 2013. Download high resolution image. Schools based in Johannesburg, the West Rand, the East Rand and Pretoria are encouraged to enter the competition by responding to the Mpact Recycling competition email. 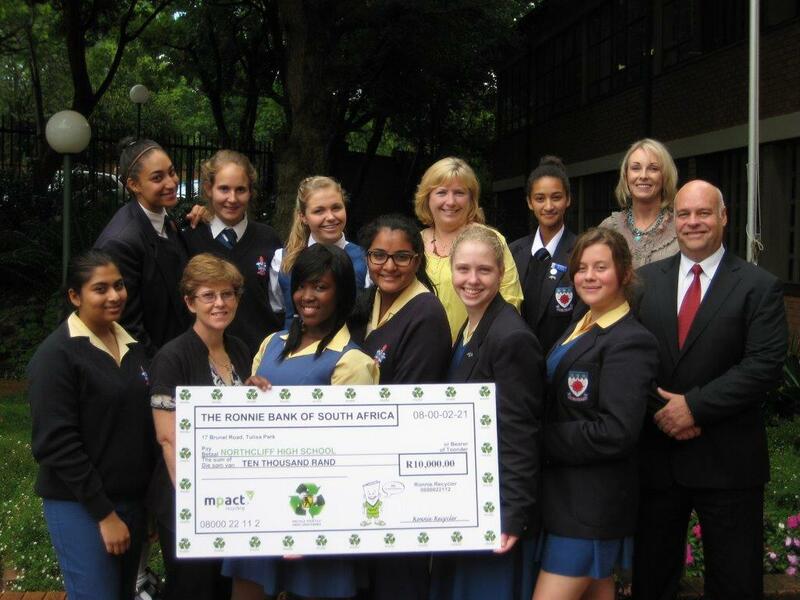 The competition, which started two years ago, aims to encourage learners to recycle paper at an early age. Last year a total of 46 schools based in Gauteng entered the competition and managed to collect 24 tons of directories and paper. “We would like to encourage more schools to take part in the competition. This is a great way to teach our children aboutthe importance of recycling and the direct benefits it has for the environment,” says Gauteng regional manager at Mpact Recycling Alan de Haas. “Based on the areas where the most telephone directory books are distributed, Trudon has identified 10 regions where the recycling programme will be rolled out. Our research indicates that most schools based in those areas are keen to participate in recycling programmes,” says Clarissa Smith, Corporate Social Investment Manager at Trudon. The school in each of the identified areas that collects the highest tonnage of old print directories and paper stands to win resources to the value of R10 000. In an effort to instil the culture of recycling, Mpact Recycling also runs the school Paper Pick-up Programme that allows schools to raise funds by recycling paper while providing children with environmental awareness. “Schools are given a paper bank or Ronnie recycling bags for easy collection and storage of recycled paper. The general community can also support schools, organisations and charities by placing their paper in the igloo-shaped paper banks,” says de Haas. Trudon, the publishers of the Yellow Pages, is a South African company delivering affordable, effective advertising and marketing options to the SMME and corporate market – with more than 127 000 companies making it their advertising provider of choice. The company's head office is in Johannesburg and has six other branches in South Africa. Trudon publishes and distributes 19 regional books in all of the 9 provinces in South Africa. We have also secured a joint venture with Telecom Namibia Limited whereby we compile, supply and deliver the directory in Namibia. The flagship brand is Yellow Pages, the globally trusted directory that is now in the forefront of advances into new media communications. In print and online, via mobile and telephony, we deliver the best and most versatile local commercial search options. In order to further enhance its growing online product suite, Trudon now also sells Google Adwords and is the first Google Premier SME Partner (PSP) in South Africa. Trudon is the owner and publisher of the Yellow Pages, the Phone Book, HereNow- a rate and review website and the operator assisted 10-11-8 business enquiries. The information is also published online at www.yellowpages.co.zawhere you can get access to Maps and Directions.